For many physically disabled people, the quest for outdoor recreation is just as strong as it is for able-bodied folks. Avid hunters, fishermen, archers, snow skiers, and snowmobilers don't allow their various disabilities to stand in the way of their favorite outdoor sports. In fact, many clubs and organizations for disabled people offer a calendar of events filled with outdoor experiences. Adaptive Sportsmen, a relatively new organization based in Wisconsin, has organized many successful hunting and fishing expeditions over the past year for their members. Costs are typically held to a minimum by the generous donations from outdoor businesses and the help from enthusiastic volunteers. 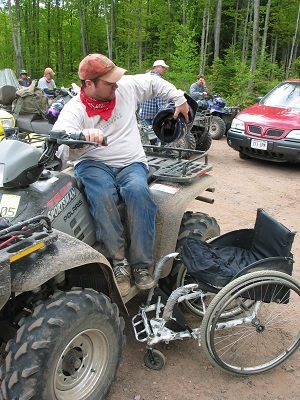 Recently the Adaptive Sportsmen crew held an ATV riding event at the Pine Forest Lodge in Mercer, Wisconsin. Located in Iron County, riders could access the extensive OHV trail system directly from the lodge on the shores of Spider Lake. Pine Forest Lodge is not only wheelchair friendly, but offers many special features and activities for disabled guests such as fishing, boating, canoeing and kayaking. A group from the National Off-Highway Vehicle Conservation Council attended the event with NOHVCC President of the Board of Directors Dan Kleen, who is physically challenged himself. "It's great that more people get to see how valuable a tool ATVs are for people with disabilities," explained Kleen after the event. "ATVs are actually a great equalizer for physically challenged people. We get to recreate on equal footing with our friends who aren't limited and get to see lots of great back country that we would otherwise not be able to get to with our cars or chairs. And ATVs are not only a godsend for folks in wheelchairs, but they can also open the woods to people with many other less-debilitating disabilities." What a lot of people don't realize says Dan is that the automatic-shift ATVs of today don't need much, if any, modifications for disabled riders. And many able bodied folks are surprised to see how well riders with paralysis below the chest or waist can tackle the trails. "There were a lot of advanced riders at this deal who really put their quads through the paces," says Dan. "And on the other hand, we also had the opportunity to introduce some riders to the sport for the very first time this weekend." The three days of trail riding at the Mercer event offered two different guided groups to ride with each day, a fast bunch for the experienced riders and a more sedate tour for the beginners. "NOHVCC is proud to be a part of this first annual event and we're really looking forward to next year already," Dan concluded. "This group really appreciates their opportunity to ride the country's trails and show it by recreating responsibly. It's groups like these that keep the OHV image positive and I want to thank the Adaptive Sportsmen, the Pine Forest Lodge, and all the volunteers who helped put on this fun event. I would also like to encourage other OHV enthusiasts to get involved with disabled organizations and get some ride events going. It's usually a good time for everyone and you might even get some new members for your riding club." "A lot of us have found out that having an ATV is essential to having any freedom in the woods," explains Al Neu, the Editor of the Adaptive Sportsmen newsletter and primary organizer of the Mercer ATV ride. "However it's sometimes hard to make a living in a wheelchair so what normally is an affordable sport (ATV riding) becomes marginal simply for that reason." With that in mind, the Adaptive Sportsman managed to offer the entire weekend- food, lodging, and ATVs- for $30 per person. Al says they couldn't have done it without the generous support from John and Cheri Stratte, the proprietors of the Pine Forest Lodge and the local riding club folks who volunteered their time and ATVs. "MIGHT HAVE TO BUY ONE OF THESE THINGS!" Joy Combs of Minocqua, WI was one of the riders who attended. She used to ride a three-wheeler years ago but hasn't been on ATV for quite some time. "We had a great ride on Saturday even though we got lost," she said. "But that just made it more interesting." 64 year-old Bill Koch of West Bend, WI contracted MS recently and had to give up his favorite sport of golf. "I decided to give ATVs a try and this was my first ride ever this weekend," he beamed. "I didn't know if I could handle it or not but this Bombardier I rode worked great. I just might have to buy one of these things!" Former motocross racer Doug Bureta of Pewaukee, WI got his second ever big ride on ATVs during the weekend. "ATVs give me a freedom more than anything else," he says. "The only thing I might want to try different is velcroing my legs to the side of the quad so I can wick it up even more down the trails!" 31 year-old Pete Lepage and his wife Karly came in from the Minneapolis area with their own machines. Pete lost the use of his legs in a 3-wheeler accident about 10 years ago and works today as a truck dispatcher. "I saw a blurb about this ride in Sports and Spokes magazine so we gave it go," he smiled. "These trails are great. We got into some tough stuff and some mud and I had to help pull someone out. And the Pine Forest Lodge is an awesome place for an event like this- I even got to kayaking the other morning too." During the final night campfire, one of the participants in a reflective moment, pretty much summed up the mood of the entire weekend. "Ya know, recreation really helps make life better." For more information, contact Adaptive Sportsmen by phone at (414)617-4870, e-mail at [email protected] or check out their website at www.adaptivesportsman.org. May 2012: Memorial Day: The Most Dangerous ATV Weekend? July 2011: Where Can I Ride my ATV? June 2011: What Kind of ATV is Best for You? June 2011: Need help with ATV issues? Call these guys! ATVcourse.com is a leading provider of ATV safety education and certification across the United States and Canada. Our online ATV safety course allows riders to meet mandatory education requirements in their State or Province. Need help? Talk to us! ATVcourse.com is the provider of online ATV safety education across North America. Our ATV Safety Course is interactive, with visual exam questions and professional narration. ATVcourse.com is owned by Fresh Air Educators Inc.